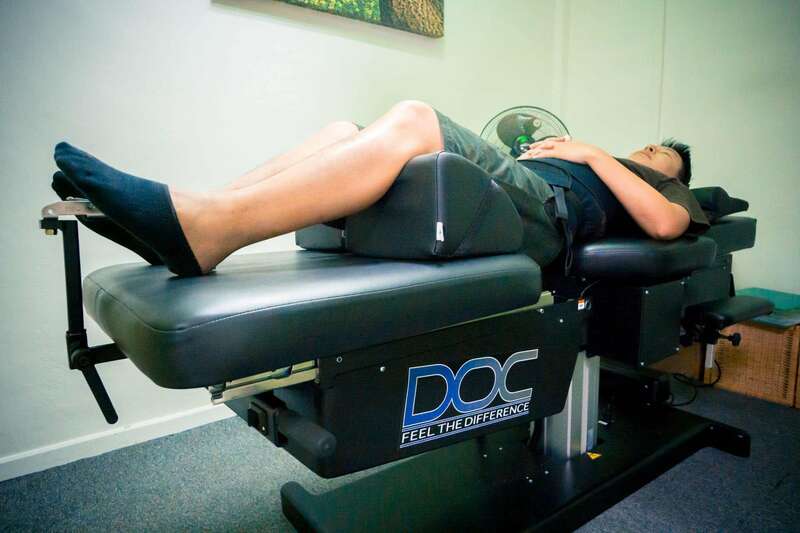 Spinal Decompression Therapy is the nonsurgical spinal decompression is a type of motorised traction to help patients to relief neck pain and low back pain. The spinal decompression machine gently uses force to stretch or pull the specific vertebre to decrease the pressure on the spinal nerve. Depend on the severity and how complicated the case is. Each decompression therapy session can last anytime from 15 minutes to 40 minutes. That is why it is very important for patient to have a consultation with the chiropractor before he/she makes a decision. What can Spinal Decompression treats? You can refer to our price table for Spinal Decompression Therapy Fees. Suspect that you may have a slipped disc? Are you looking for an non-invasive treatment method for your back pain? If you have any of the above conditions, you are not suitable for spinal decompression. We will also assess your suitability for the treatment on your first appointment. Book an appointment with us today for a professional consultation with our chiropractor or drop us an enquiry to find out more. We will try to reply to you as soon as possible. If you want to understand more about chiropractic, find out more at our Singapore Chiropractic Guide here. In a study involving 219 patients, 86% of the treatments were successful. After treatment, each patient rated themselves on the Oswestry Pain Scale, with a reduction of pain to 1 or 0 indicating treatment success. 188 patients reported a perception of pain of 1 or 0, without the need for further medication. These patients also regained the range of motion of their backs and any sensory or motor loss. The rest of the 31 patients saw some improvements in their pain and disability score, despite not being fully recovered. It was also noted that the success rate decreases with the increased severity and complication of the condition. What is the different between Chiropractic and Spinal Decompression? Chiropractic is a system of complementary medicine based on the diagnosis and manipulative the misalignments of the joints, especially those of the spinal column, which are believed to cause other disorders by affecting the nerves, muscles, and organs. We will always recommend both treatments for patients who are suitable for Spinal Decompression Therapy.